Lego blocks are great for building almost anything you can imagine. Unfortunately, if you want those creations to be adult-sized, you're going to need a ton of Legos. 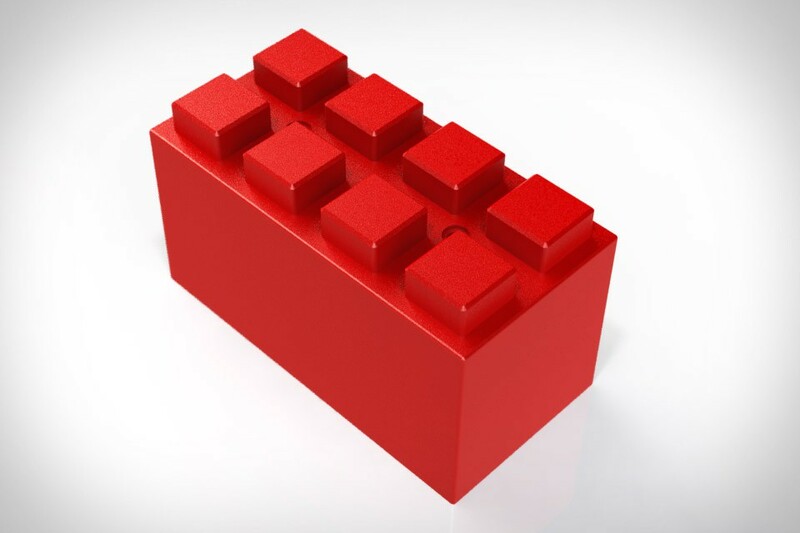 Or just some Everblock modular building blocks. With a design reminiscent of the Danish toys, they can be assembled into chairs, shelves, tables, beds, room dividers, or even complete temporary structures. Just like their smaller counterparts, they can be reused simply by disassembling whatever you've created, and come in 12", 6", and 3" sizes, with finishing caps available to give them a smooth appearance. It fits in the palm of your hand. Yet its screen is larger than anything you can fit in your backpack. The Touchjet Touch Screen Projector combines the innards of a tablet with a projector and an optical sensor, allowing the projected image to work as a giant 80" touch screen. It has 4GB of flash storage and another 16GB on an internal SD card, a 1.6Ghz dual-core processor, built-in Wi-Fi and Bluetooth, and offers compatibility with apps from the Google Play store. Arrives with a remote, as well as two styluses for interacting directly with the screen. Be it a busy street, a crowded commuter train, or just everyday noise, there are plenty of times we'd like to have an EQ for the sounds around us. And that's just what the Here Active Listening System provides. This pair of wireless in-ear buds works in conjunction with a built-in DSP and a companion app to give you control over real world sounds. Active noise cancellation can drown out unwanted sounds, the equalizer can transform live music, sound effects and filters let you experiment, and preset modes make it easy to manage common situations. The buds offer a battery life of six hours, and include a case that doubles as a charger. Clever name. Even more clever features. The Awair Air Quality Monitor, as the name suggests, uses a host of sensors to keep track of the air around you, including the temperature, humidity, carbon dioxide, toxic chemicals, and dust. But instead of leaving it up to you to make use of those numbers, you tell it what's important you — allergy concerns, sleep quality, or productivity, for example — and it will make suggestions based on its reading to help change your behavior. In addition, it can also talk to connected devices like thermostats, humidifiers, air purifiers, filters, and fans, so it can take care of adjustments all on its own. The worlds of rock music and skateboarding aren't that far apart, but they are truly combined in the form of these Prisma Skateboard Guitars. Built using wood from broken and used skateboards, each guitar is legitimately one of a kind. The beautiful instruments use anywhere between 4 and 44 skateboards before they are completed by the a 22 year old self-taught woodworker who creates each one from scratch. Hours of skating get recycled into hours of strumming in the form of these truly unique pieces of musical art. No need to bring along a complex deck to your next gig — Mixfader gives you all the tactile feeling of a physical slider with none of the bulk. This slim aluminum gadget connects wirelessly to your phone or tablet, and uses a companion app to let you control the action with uncommonly low latency. Its integrated battery provides up to 10 hours of use on a 25 minute charge, the app works with your built-in library as well as with services like SoundCloud and Deezer, and thanks to Bluetooth 4.0 technology, you can use up to two devices, simulating a dual turntable setup. At best, some styluses are pressure-sensitive. At worst, they're just a "dumb" piece of material with a plastic nub on the end. The Phree Writing Device is neither. It uses patented Optical Translation Measurement (OTM) technology to let you write on nearly any surface — a tabletop, a dashboard, your hand — and is compatible with tons of different software. It has an OLED touch display that lets it do more than just doodle, as it can also function as a handset for phone calls, and can display incoming texts (you can even use it to write back a response). The optional carrying case doubles as a stand for your phone, and with an open API, its utility isn't limited to what it can do out of the box.